You could say Tinisha Johnson wears many hats. She is the founder of Have Stress Relief Now and the author of Lessons Learned: Loving Yourself as a Black Woman. Tinisha Johnson is an author and freelance writer and resides in Colorado with her family. She is the brainchild behind Have Stress Relief Now, a free online membership site created in 2009. What started out as a blog, turned into a full launched website as of 2011. After a failed marriage and two small kids, Tinisha thought it best to take a new route in her life; one that involved various ways to manage stress on different levels. Stumbling upon the following three books: Unstoppable Women by Cynthia Kersey, The Power of Now by Eckhart Tolle, and Do You! by Russell Simmons, these books literally changed her life, and from that change, Have Stress Relief Now website was created. Have Stress Relief Now is about helping YOU! Ever have too much to do, and not enough time? Interested in shedding a few pounds? Wonder what's the most effective way to organize both your personal and professional life? Interested in finding that someone special or improving your current relationship? If you've ever pondered on questions like these, then Have Stress Relief Now is for you. The site provides you with resources to manage your personal and professional life. Tinisha wanted to make the information she provides through the site diverse, because let's face it, everyone's problems and stress are sometimes different and unique. By signing up to become an online member, the site will introduce you to all types of articles, services, products, and prizes that are of high quality and have proven results in the area of stress management. Forget About What You Don’t Want, and FOCUS, FOCUS, FOCUS On What You Want Right Now! Sometimes it can seem as though we do not have control over our lives. We want this or that, but yet, our thoughts are focused on something totally different, and on the flip side we’re feeling something completely different. When this happens, our thoughts, actions, and feelings are conflicting, and when that happens, it’s easy to feel out of control, or that life is pulling us by several strings in different directions. To feel a sense of meaning and peace, your thoughts, actions and feelings have to be in harmony. Understand you do have direct control over your mind, which is the strongest component we have as humans. • I have direct control over my attitude.• I have direct control over my actions. • I have direct control over what I allow myself to think about. • I have direct control over removing unpleasant thoughts out of my mind. • It’s okay to make a mistake, but it should not okay for me to keep repeating the same mistake, and not learning from it. Also realize with mistakes can come consequences. Take it for what it is and move on with extra positive energy. • I have direct control over everything that goes on inside my body, sprit, and mind. Treat the outer things as irrelevant. • When I’m hurt or feeling low, I will always take it as a lesson learned for good or for bad and still move on with extra positive energy. Recognize your control. Own it and live it. Create a mission statement for your life right now. What do you stand for? What are you about? Where is your life heading? What do you REALLY want? If you’ve enjoyed this passage, it’s been inspired from the self-help book, Lessons Learned: Loving Yourself as a Black Woman. AVAILABLE NOW! 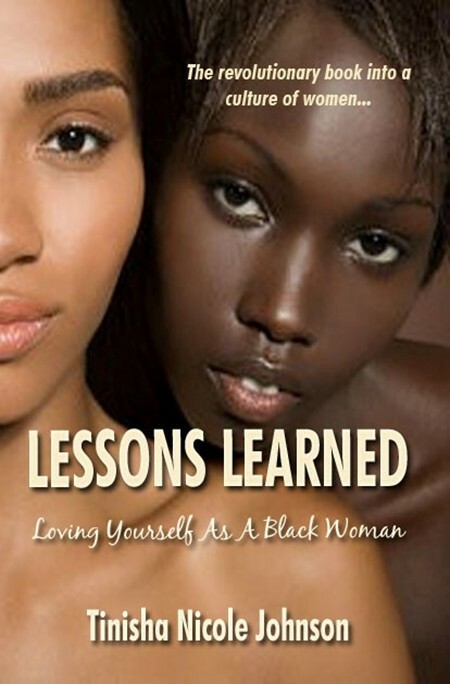 Although geared towards women of color, the book will benefit any woman looking to make drastic changes in her life. Thank you for having me as a guest on your blog. I really appreciate it.